In my first three books I refer to ‘Greek Troy’, using the Greek name ‘Troia’. My Troia was a mythical city, but didn’t Troy disappear well before the Greek classical Age? No, Troy was established in 3,000 BC by an Anatolian people (probably Luwians) who according to Homer could speak the same Greek as their Mycenaean foes so might have been related. From the very first Troy was a massive and wealthy fortress city controlling lucrative sea and land trade routes. It maintained its independence, possibly for thousands of years despite having many hungry neighbours and fighting several wars. By classical Greek times (under the name Ilion) it was said to have dwindled, but it was still visited by Xerxes and Alexander the Great, to name a few. It was involved in that part of the wars between Athens and Sparta that were fought in Greek Turkey. It became large again in Roman and Byzantine times and was important in tourism, wars and local politics. It even had its own Bishop. Most of its functions were progressively taken over by ‘Constantinople’. It was finally abandoned maybe eight hundred years ago, as Christian Constantinople began its terminal decline, leading to its fall and the start of the so called ‘Dark Ages’. 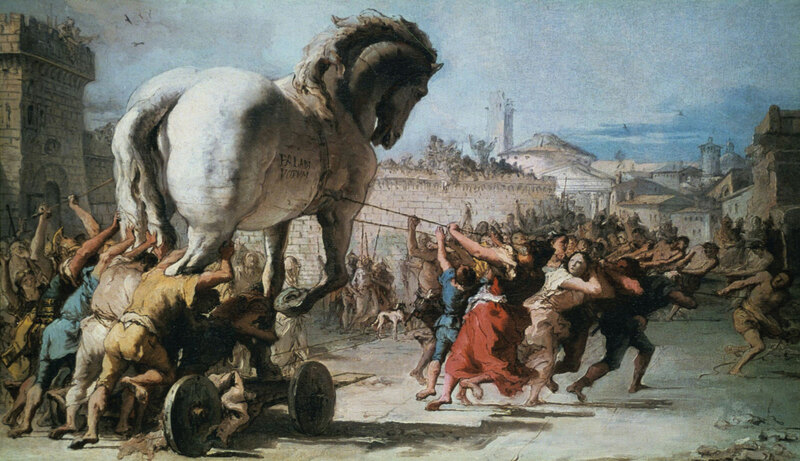 There may have been doubts about the historical accuracy of Homer’s classic, but there could never have been much doubt about the existence of Troy and its approximate location, despite some claims. Heinrich Schliemann, who did the deepest excavation at Troy, perpetuated a lot of colourful myths around the ancient city and his own life, some of which linger today. Some of his more outrageous claims are still repeated uncritically (e.g. he had devised a method to learn any language in six weeks). Simply put, he was a conman, adventurer and self publicist, one who had become wealthy. Claiming sole credit, he took over the careful archaeological excavations of his ‘partner’ Frank Calvert with money, dynamite and brash ignorance. He assumed Priam’s Troy would be at the lowest level, and his workers hastily blasted down to a level which would have been a thousand years before Homer’s tale. In doing so, they discarded any upper levels that would have included ‘Priam’s Troy’ and maybe his palace. He left a massive trench which forever destroyed much of the archaeological evidence. Even the shy Calvert was appalled and publicly denounced his conclusions, referring to the pottery record. Still Schliemann for all his faults, inflamed popular enthusiasm for Aegean archaeology and (partly by setting a bad example) drew attention to the need for more careful archaeological excavation and the importance of ‘strata’ in a dig. Later he did improve his techniques and listen to advisors. Today, a short (pre-)history lesson about a little known people mentioned in Books 1 and 2. The Neolithic and early Bronze Age occupants of Greece, the ones that later Greeks called ‘Pelasgoí ’ (people of the sea). It was they who first established and named many of the important southern Greek cities (Athens, Thebes, Mycenae). They survived through to the Classic Greek Age on islands and in small mainland enclaves and were described as speaking a ‘barbaric’ language (not ‘Greek’). Greece is rocky and mountainous. Many of the choicest areas, and those easiest for transport and trade are connected to the sea. 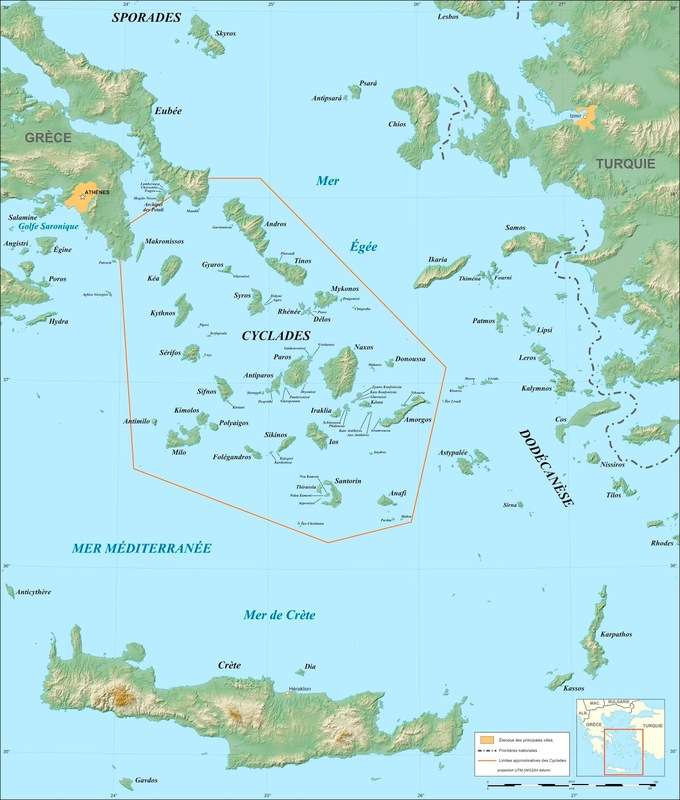 So it is no accident that the Neolithic revolution (animal husbandry and farming), arrived in Greece by island hopping across the Aegean around 7,000 BC (from Anatolia/ Turkey). By 3,200 BC the new arrivals had established a thriving and advanced seafaring civilisation that we now call the ‘Cycladic Culture’ after the maze of small islands north of Crete. At the same time many of the cities in southern Greece (occupied since Neolithic times) showed major advances. The larger Minoan Civilization (Crete) came about 500 years after, they also did not speak Greek (see Eteocretan below). They invented writing (linear A, not yet deciphered) and absorbed the smaller Cycladic Culture around 2,000 BC. 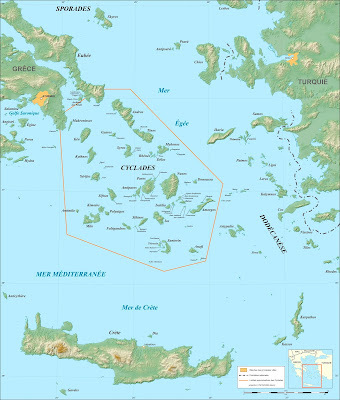 At about this time (2,000 BC) there was a sudden economic and political decline in southern Mainland Greece which some have blamed on an invasion by the Greek speaking Mycenean Indo-Europeans, though others have pointed to the lack of widespread destruction or sudden change in culture. This points to an important gap in our knowledge, where and when did the Greek Indo-Europeans (the ones we call 'Greeks') arrive? The current accepted theory is that Indo-Europeans (mainly nomadic pastoralists) evolved in the Great Steppe north of the Greater Caucasus Mountains and spread out overland to arrive in the Balkans/ north of Greece about 4,000 BC. Linguistic evidence has been used to suggest (Indo-European) proto-Greek speakers had settled throughout the river valleys and the few plains ( e.g. Thessaly) that can be found in Northern Greece, by around 2,200 BC. Their arrival to the south didn’t have to be massive hordes burning everything in their path (as seen in later history). It is more likely they joined and dominated the earlier people of Greece. For instance, in Anatolia/ Turkey the Indo-Europeans (Hittites) took something like 2,000 years from the time they arrived to when they finally absorbed and partly built upon the indigenous early Bronze Age Hattian civilization of Anatolia. The decline in Southern Mainland Greece (2,000 BC) may have been caused by the absorption of the land starved Cycladic Culture by the larger Minoan Culture and a new focus on Crete, leaving the former mainland colonies as isolated backwaters. The takeover by the vigorous but less civilised northerners, as I said, may then have been less catastrophic than first pictured. However it happened, when the dust settled (1600 BC) the warrior culture of the Myceneans was firmly in control, often in cities occupied since Neolithic times, and everyone was speaking the new Indo-European language. In 1650 BC, 100 kilometres from Crete, the island of Thera exploded in one of the largest volcanic explosions in recorded history, leaving a massive Caldera, part of which is modern day Santorini. It caused a massive Tsunami that devastated the maritime Minoan empire, maybe inspiring the legend of Atlantis. The Myceneans arrived to take charge in Crete not long after that.